Fla.—Artillery will launch a double set of concerts in Fla., in April. The first will take place at West End Live in Orlando, on April 17. The second will take place at The Brass Mug in Tampa, on April 19. The “United Legions” U.S. takeover will begin at Five Star Bar in Los Angeles, on April 10 and end at Metro Bar in Salt Lake City, on April 27. 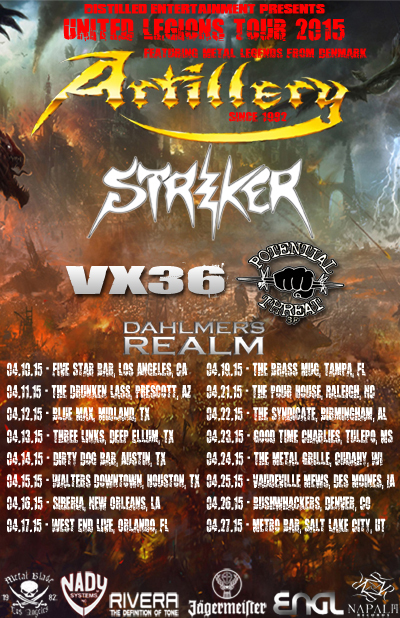 Dahlmers Realm, Potential Threat, Striker and VX36 and will be accompanying them on tour. It is presented by Distilled Entertainment and sponsored by: Metal Blade Records, Nady Systems, Inc., Rivera, Jägermeister, ENGL Amps, and Napalm Records. After the U.S. tour—Artillery will be touring China, for the first time in their history. Brothers, Michael and Morten Stützer, joined forces to form Artillery in 1982. They are one of Europe’s oldest and key elements of the thrash metal scene, with their roots stemming from the Copenhagen suburb of Taastrup, Denmark. "Artillery are doing what they were surely born to do, namely hurling impressively intricate, ridiculously tight thrash anthems from every direction, they are still unstoppable." "...one of the best thrash metal albums this year..."
"The songwriting talent on display is formidable, and all the instruments turn potentially routine passages into extra appendages that work always in the band's favor." "...this new album proves that they're still fighting on, with no end to the war for thrash metal in sight."